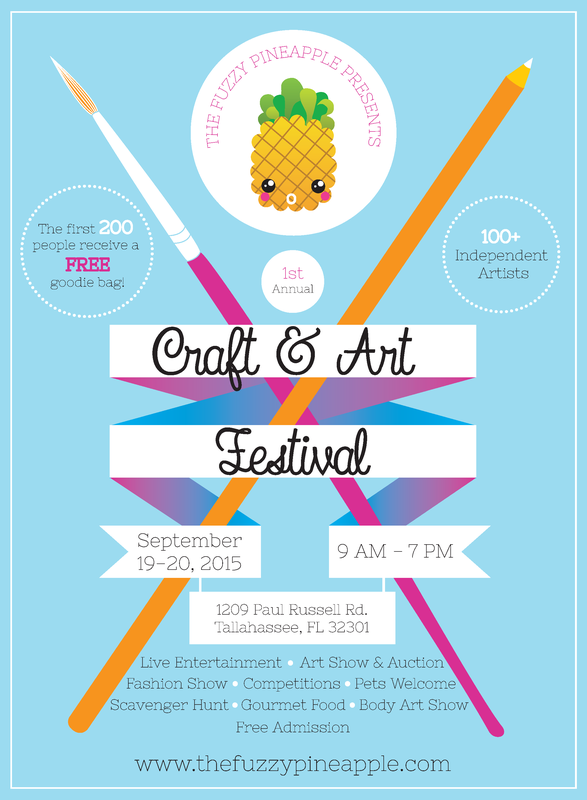 The Fuzzy Pineapple is hosting a Craft & Art Festival September 19-20 from 9AM to 7PM at 1209 Paul Russell Rd in Tallahassee, FL. The event will feature live entertainment, art show & auction, fashion show, competitions, scavenger hunt, gourmet food, and a body art show! Pets are welcome and admission is free! Art In the Park – Students can enter the all day art competition. This is juried and prizes include up to $100 in cash prizes, gift cards, art supplies, fuzzy pineapple items, and/or a free 10×10 booth for next year. Art Installation – Students can create art installations on site or bring their art the day before the event to showcase with the theme “pineapple party.” This is juried and prizes include up to $100 in cash prizes, gift cards, art supplies, fuzzy pineapple items, and/or a free 10×10 booth for next year. Speed Art Contest – Artists can participate in a 20 minute speed art contest on stage for fuzzy pineapple packages, gift cards, and prizes redeemable at the information booth. Art Auction – Students can submit their art to the art auction and receive 80% of the funds from the sale. Artist Panel – Artists can explain their work, creative processes and what drives them to create on-stage. Vending – For a small fee, students can sell their wares at the festival and/or share a booth with other artists. Entertainment – Students can showcase on-stage their skills or talents, do a demonstration, teach a short class, or participate in the fashion or body art shows as models or emerging artists.